The Lazy Suzy table, designed by Sung Sook Kim in 2015, gives a modern twist to sizable traditional tables designed for large receptions. The distinctive feature of this design object is its revolving tray (single or double) placed on the central axis of the table, which, in the guided version, can move in a linear fashion along its entire length, while spinning on itself. The smooth shapes and flowing motion of the tray favour the sharing of food between all diners. The chance to freely combine finishes, in contrast or in harmony with the surrounding space, playing with the various materials available for the top and the lacquered colours of the tray, characterizes the object, making it unique. Its large size makes it an ideal solution for meeting rooms too. 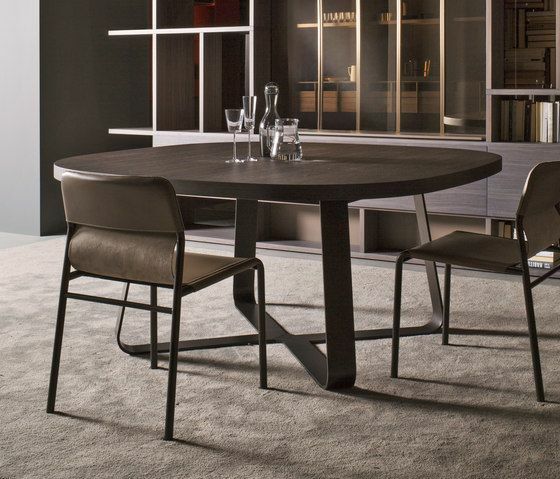 In the 240 cm and 300 cm length versions, a sliding mechanism, completely integrated into the top, further embellishes the table. This allows the tray not only to spin on itself, as in smaller tables, where it is placed in the centre, but to slide freely along the entire length of the top, conveniently and practically serving all diners.